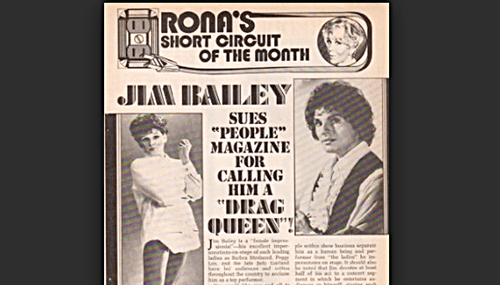 Legendary female impersonator illusionist Jim Bailey who did spot-on re-creations of such iconic female entertainers as Judy Garland, Barbra Streisand and Peggy Lee, has died. He was 77. Bailey performed in nightclubs around the world and in such celebrated venues as the Palladium in London, Carnegie Hall in New York and the Dorothy Chandler Pavilion in Los Angeles. She became his mentor, and Bailey landed a gig on CBS’ The Ed Sullivan Show, dressed and made up as Garland and singing like her. After that performance, the Las Vegas hotels came calling. The showman also guest starred on The Carol Burnett Show, where he and Burnett sang “Happy Days Are Here Again” with Bailey appearing as Streisand. Bailey was approached by Lucille Ball in 1973 after she saw him at the Dorothy Chandler Pavilion and asked him to guest star on her popular television show, Here’s Lucy. Ball was so impressed by Bailey and his performance, she titled the show Lucy and Jim Bailey, and she also threw a party for him after the show’s taping. The two remained close friends until Ball’s death in 1989. Bailey also became very close friends with Ball’s daughter Lucie Arnaz. The two remained close friends doing benefit performances in honor of her late mother and father at the Lucy Desi festival in Jamestown, New York. Also in 1973, Bailey teamed with Liza Minnelli, daughter of his mentor Judy Garland, in Las Vegas at The Flamingo. The two put together a concert recreating the performances by Minnelli and her late mother in London, with Bailey standing in as Garland. The “Judy and Liza Concert” met with great success, they opened the show with Jim as Judy singing “Well, Hello Liza” just as they had done at the Palladium years earlier. Later, Minnelli made a gift to Bailey of one of her late mother’s treasured pearl rings. >Bailey continued performing his characterizations, including benefits for AIDS research charities around the world. In July 2008, Bailey was slated to appear in Hollywood, London, New York and San Francisco, marking 40 years since he first performed as Garland in 1968. Bailey died Saturday of cardiac arrest from pneumonia complications at Pacifica Hospital of the Valley in Sun Valley, Calif., his manager of 27 years, Stephen Campbell, told The Hollywood Reporter. “Heaven is getting a fabulous show tonight with standing room only! Rest in Peace Our Sweet Prince,” reads a statement on Bailey’s website. He really was amazing. I remember him from my youth but had not thought about him in years. I am sorry to admit that. He was almost too pretty for some on the singers he was impersonating.